In support of Starlight Children’s Foundation, Swarovski will be hosting an in-store VIP night for its valued customers and donating $1 for every purchase made to the Australian charity. Starlight’s mission is to brighten the lives of seriously ill children. Since 1988, Starlight has partnered with Australian health professionals to develop programs based on positive psychology principles that support the ‘total care’ of children and teens. The Australian charity disrupts the relentless cycle of pain and trauma to offer a welcome break so that sick kids can simply be kids. “We are thrilled to be uniting with Starlight Australia for a greater impact of giving back to our local community. This November, we’re proud to offer our valued customers the opportunity to join in the wonder of giving during our exclusive VIP Shopping Night with $1 for every purchase made going to the charity.” comments Victoria Brown, Marketing Director for Swarovski Australia. 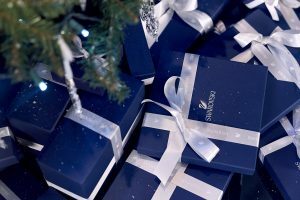 Born in the spirit of kindness and goodwill, Swarovski’s VIP Shopping Nights will also offer free gifts to every Be Swarovski & SCS member who purchase on the night. Eligible customers can partake in a lucky dip to receive either a blue Swarovski backpack, a Star ornament or a Sparkling Pin Set. In addition, any purchase in-store over $220 will receive a free Star ornament. Swarovski has had a long-standing commitment to philanthropy and charitable giving on a global scale. Since 2000, Swarovski Waterschool has been working in schools and communities around the globe to empower children, families and schools to become water stewards and leaders in sustainable development within their community. In addition, the Swarovski Foundation supports culture and creativity, champions the promotion of wellbeing and is committed to conserving natural resources. Swarovski’s VIP shopping Night will take place on either 15th and 16th November at selected Swarovski stores and stockists across Australia.